Unless you have been trapped on a deserted island I’m sure you have all heard of the CBS reality show Survivor. The basic premise of the show is that at least 16 strangers are put on a deserted piece of land and have to basically fend for themselves. They prepare their own shelters, find their own food, boil their own water. Occasionally, through winning challenges, they are provided with certain items that make their life without the mere basics easier and sometimes they even win luxuries such as gourmet meals. Each week someone is voted off of Survivor and the last one remaining is sole Survivor winning a Million Dollars. Or, as CBS Survivor likes to say it… They must “Outwit, Outplay, Outlast” in order to win Survivor. 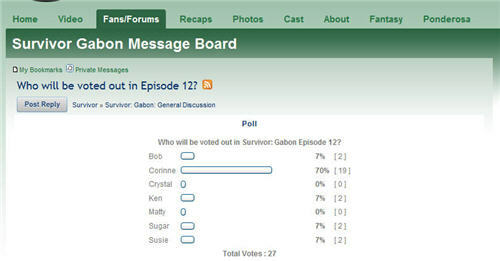 It appears that Survivor has a huge fan base…. almost cult like. And, after 17 seasons the fans are still watching every week. I find it fascinating that Survivor fans are still watching. After all, I stopped watching after the 2nd season. The 2nd season was amazing, but I found when I tuned in to watch the 3rd I was getting bored with the same thing…. I moved on. How come there weren’t so many others doing the same thing?? Well, I’ve come to a conclusion that Social Media has something to do with that!! If you take a look at CBS’s Survivor website you will see that they have tons of things that viewers can participate in. Videos – Full episodes, Clips, Life after they are kicked off Survivor. Not only can you watch and enjoy, but you can also comment and see who else is commenting on the same videos. Photos – Amazing images taken from each episode. Again, make any comment that you would like. Communicate…. that’s what Social Media is all about. Ponderosa – Life after Survivor. Around the halfway point of survivor the people voted off of Survivor are part of a jury that will help choose the Ultimate Survivor & Winner of the Million Dollars. Instead of being sent home they are sent to Ponderosa…. a camp for the Jury. Here you can see videos shots of what the members of the Jury are doing. These are things you don’t get to see on the show. Very cool!! Cast – You can mark yourself as a fan of any of the Survivor participants and see who else in the Online Survivor Community is also a fan. This is a great way to choose which of the online community you want to be friends with. Forum / Message Board – Plenty of Survivor discussion going on here. 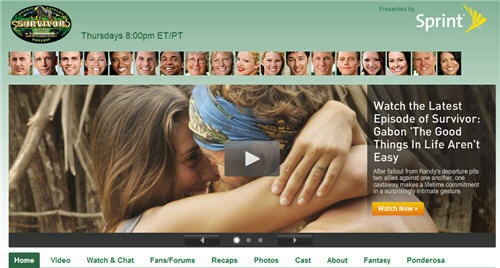 Watch and Chat – Watch the latest episode of Survivor while chatting with other online survivor community members. This is by far my favorite social media activity on the Survivor Website. Friends / Profiles – Make friends and have private and public conversations with other fans of Survivor. I couldn’t find a page with the Survivor community members listed. Instead, you can find friends through the comments, forums or through the watch & chat. This isn’t the most user-friendly way, I know. However, I was very surprised to not find a Survivor Blog on the CBS website. I believe Survivor use to have a blog called the Survivors Strike Back Blog. It doesn’t appear that the blog is active any longer. I believe past Survivor participants wrote posts on the blog. Sounds like something the fans would have loved. My guess is that making sure the Survivor participants kept actively posting might have been a chore in itself. However, I’m not sure why there isn’t some kind of blog still active. I did find a very cool Survivor Blog, however it does not appear to be affiliated with CBS. Watch and Chat was by far my most favorite feature of the Survivor site. Watch and Chat is a new feature on the Survivor website where you can watch the latest episode and chat at the same time with other members of the Survivor Community. You can chat with all the people in Watch and Chat, select just a few to chat with, or even choose to watch the episode alone. But, I believe watching it alone you are missing out on the coolest feature… chatting with others about the episode. Being caddy, being critical, being silly. However, there was no live chat….. no way to watch the show on TV while it aired on Thursday night and chat with the Online Survivor Community while we all saw it for the first time!! I was so disappointed. Chatting with the survivor community while the show aired is what I looked forward to the most and I was shocked to find that the Survivor site had no live-chat feature. FAIL!! 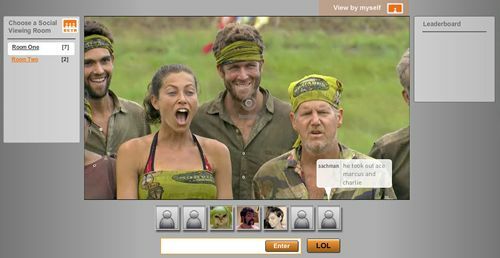 I was thankful to discover another site that had Survivor Live Chat that I participated in while the show aired. They are a wonderful group of fans and I had a blast with them. Make sure to be there around 8:00 pm EST on Thursdays when Survivor airs and you are sure to have tons of fun!! The community there was awesome. They accepted me with open arms, asked me questions, let me join in on the conversations. There is even a section to ask Jeff Probst and the Cast of Survivors questions. The community members are fans in the truest form. They are honest, loyal and as most fans are…. critical. And, why shouldn’t they be? They have invested their time and energy into all things Survivor. And, if CBS is listening these fans will tell them exactly what they like and what they don’t like; What they want to see more of and what they wish they never saw in the first place. So, I hope CBS is listening because fans are always brutally honest…. they have every reason to be. Being a fan is something they have devoted their precious time to and they LOVE their time with Survivor. The fans aren’t afraid to share their thoughts about the members of Survivor either. They will be blunt, they will be caddy, they say it just as they see it. However, I can’t help but feel that if the forum is the most popular social media feature that it is possible that the Survivor site needs more Social Media features. Don’t get me wrong…. I love that the Survivor site has forums. Forums are a great way to hold discussions with members, get answers from other community members, and to build relationships. Forums have their place and I’m glad to see them on the Survivor site, but they are quite “old school” Social Media. I’d love to see the survivor site have more spontaneous discussions… more real time conversations. I believe Live Chat will do the trick. If they aren’t providing the Social Media activities that the viewers are looking for they will look somewhere else…. like the live chat and blog I found elsewhere. So, that brings me to…..
CBS is totally doing a good job to capture the viewers attention and get them conversing via Social Media, but there is definitely room for improvement. What I would like to see is a…. Blog – Give your viewers a little more info. Maybe a Friday morning post…. day after the show airs of a little synopses of what happened in the show the night before. Maybe some gossip of past Survivors, Maybe a bit of “Where are they Now” of the past survivor participants, and maybe a bit of facts about the beautiful places that the survivor shows have been held. There are so many different directions they can go with this. Plus, the readers can comment and participate too. More conversations makes for a happier community. Live Chat – Please, please, please get live chat. Even if you don’t ever have a blog…. do live chat. Nothing fancy…. 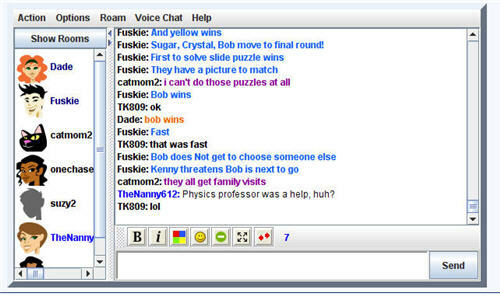 just a simple chat room that people can go in while the show airs on Thursday night. I truly believe it will bring in more fan engagement. You know where the Survivor fans are at 8:00 EST on Thursday night…. They are watching the program. Instead of not having anything going on at 8:00 pm on a Thursday night on your site…. open up Chat. Trust me, the fans will come and the community will grow… I truly believe that. Have you ever been somewhere where there was no conversation? No laughing, no talking, no interacting….. just stagnation?! Without engagement what’s keeping you around? Absolutely nothing. CBS knows that in order to keep fans watching it takes more than just great shows. Fans want more. Fans want something for their time that they are dedicating to the shows…. Viewers are looking for interaction, conversation and relationships. CBS Survivor has figured that out and is providing the platform for interaction. Hey all, get your questions ready for the first player booted off Survivor: Tocantins – there’s a live chat with them on Friday. This season Fancast.com will be hosting live chats with the contestant voted off Survivor the day after the episode is broadcast on CBS. The first chat for Survivor: Tocantins is Friday, Feb. 13 at 12 noon (ET)/9 am (PT). It should be lively so ask away about what happened to them, their take on the other contestants, etc.